Still not believing her, yet knowing Lydia rarely lies about things, I told her to have Sam come show me. Sam shortly bounced up to me. “Did you lose a tooth?” I asked. 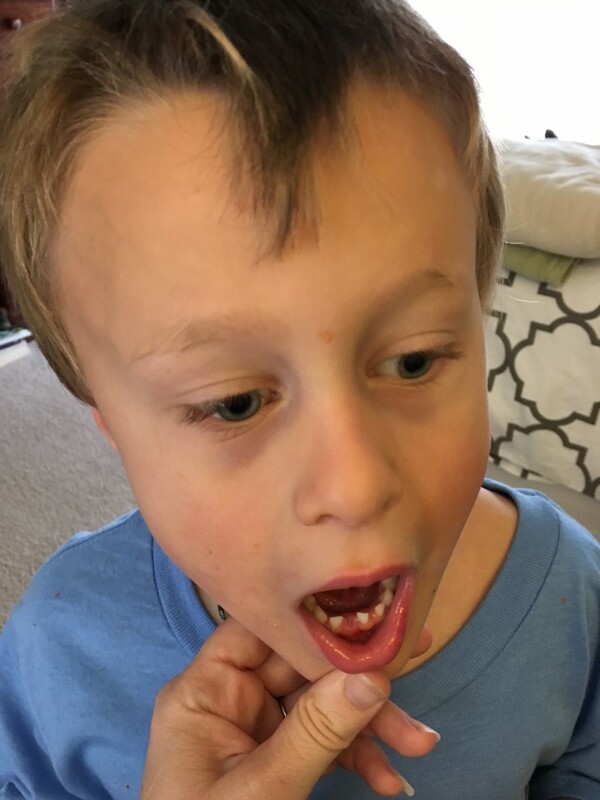 He opened up his mouth and sure enough, a lower front tooth was gone! “Right here,” he said, pointing to his mouth. He just shrugged and asked again if it was time for lunch. He really didn’t care about the tooth. After a while, Lydia and I finally pieced together what happened. At breakfast that morning the tooth was bothering him, so he reached in and plucked it out. After deciding that it was not breakfast, he dropped it onto the floor and continued eating! Soon after breakfast the floors were swept, vacuumed, and mopped, so the tooth was long gone by lunch. With Lydia’s help, we worked up a little letter to the Tooth Fairy. That night, we left it outside Sam’s door because he did not like the idea of a strange little person with wings sneaking into his room at night while he was asleep. Looking back over the last few weeks, we think Sam’s tooth has been loose for quite a while. It had to have been very loose, because if Sam’s little tooth extraction had involved blood, I would have surely heard about it at breakfast. Things involving blood are always VERY IMPORTANT. And after each question I would reassure him and say, “Don’t worry about it, baby. You’ve got a while before you loose any teeth.” In fact, that morning before the breakfast tooth incident I had reassured him again with those very same words. After all, Lydia didn’t (officially) lose her first tooth until she was six and a half, just last Christmas. Just goes to show, you can’t predict one kid based on the other.